Presented by Nonsequitur, Earshot Jazz, & Polestar. 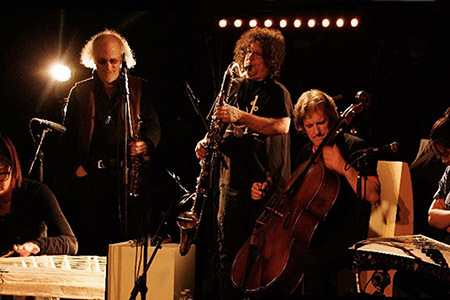 Tonight’s double bill begins with the duo of German saxophonist/multimedia artist Alfred 23 Harth and the Vancouver-based, German 5-string bass player Torsten Mueller, both of whom have illustrious histories of collaboration with a host of international improvisers. The East-West Collective is a trans-national collaboration exploring the intersection of Asian traditions with the compositional structure and sounds of free jazz. Saxophonist Larry Ochs has a voracious appetite for cutting-edge 20th-century music and has been at the helm of several creative projects during his career, most notably as a co-founder of the ROVA Saxophone Quartet. Miya Masaoka has taken the Japanese koto to new realms through her innovative use of string preparations, electronics, and lasers. French cellist Didier Petit “shoots forth intense spirals of overwhelming emotion” (Allmusic.com), often vocalizing over his full, polyphonic bowing; his compatriot, clarinetist Sylvain Kassap, is a leader in the French improvisation scene since the 1970s, playing with Barre Phillips, Evan Parker, and others. Chinese guzheng player and vocalist Xu Fengxia studied at the Shanghai Conservatory and toured with the Shanghai Orchestra for Traditional Chinese Music. Moving to Germany in 1991, she’s since collaborated with improvisers Hamid Drake, Assif Tsahar, Frank Gratkowski, Wilbert de Joode and Lucas Niggli. The 2013 tour of the East-West Collective is supported by the French-American Jazz Exchange and administered by the Mid Atlantic Arts Foundation and Cultural Services of the French Embassy.